There are times when things go wrong in our lives. Often as not, we try to hold it in not letting anyone know what happened or why. But there are always signs. This blog post by a friend directed me to this one about signs. The author argues that 1) it would be a lot easier to help and love each other if we all wore a sign around our neck stating what's going on in our lives and 2) that we do--in a way--wear signs like that. "I think we should just try to imagine it………that when a friend is quiet…or not showing up to stuff she usually shows up to….or acting a little “off”….or a family member is wearing pajamas to the grocery store for weeks on end……or not answering the phone…..or the lawn is not mowed…..whatever it is………. IT IS A SIGN. It is not a sign that can be read in words and letters, but it is a sign that someone needs to be treated gently…that they need help….most of all, that they need love, understanding…and that they DEFINITELY DO NOT need to be judged." Ever since reading that blog post, I've tried to look more carefully for signs and just jump in and help. Don't ask, just show up. Yet it leaves my jaw a little slack, when I'm reading signs and helping, and then others make comments that are full of judgement to the very people I'm trying to help. The signs seem so obvious. What to do seems so clear. So I leave with the same plea as Melody. 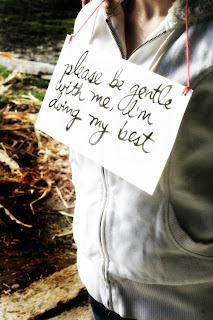 "Let’s be gentle with each other. Let’s read each other’s signs." I have recently had this happen. I am helping someone and I have been shocked at a few of the responses. The person I am helping appears to have everything on the surface, but I know they don't. I have been shocked that people can't get past their own jealously to see that all is not right. I am sad for the people who can't see past their own sorrows. I love it that you linked to such an old post of mine. :) Thanks. Just going through my blog reader today. I love love love the message of that post. I wish all of us were better at being vulnerable with one another. I am going to post about that soon.